Introducing the new blue Traveler's Notebook. The color similar to indigo dye or blue black ink and reminiscent of an azure blue sky just before dawn. It comes with a plain refill paper produced in Japan with great care using Designphil’s original writing paper designed for maximum writability, inside a plain-texture cowhide cover made in Chiang Mai, Thailand. 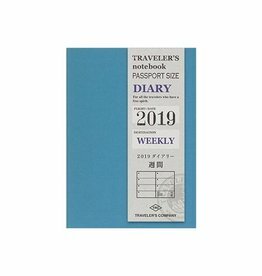 The refills are made to be the same size as passports so that TRAVELER’S notebook can also hold your passport. You can couple your favorite type of notebook refill with a Zipper Case or Pen Holder to increase storage space or expand use. Minimalist design allows you to easily customize your notebook by adding charm and beads into the rubber band or bookmark string. 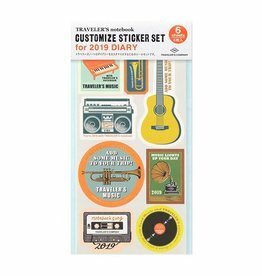 You can also stick your favorite stickers or used post stamps onto your refill notebook cover. By customizing your notebook cover and refill in your own way, you will enjoy filling your notebook and cherishing the leather texture for many years to come. There is a cotton bag included when purchased.